At CHAM we offer a high quality and affordable CFD consultancy service tailored to suit individual client needs. This is often a cost effective option which provides answers to problems where multiple scenarios must be trialled. It greatly reduces the need for physical experimentation and prototypes which reduces the time and cost to market. Our Engineers have decades of experience performing flow simulations for a wide range of industries. allow you to gain knowledge of how to use our products while completing your project in a timely manner. Provide access to general advice regarding the best way to model a particular physical process, or equipment item, making use of the available features of PHOENICS. 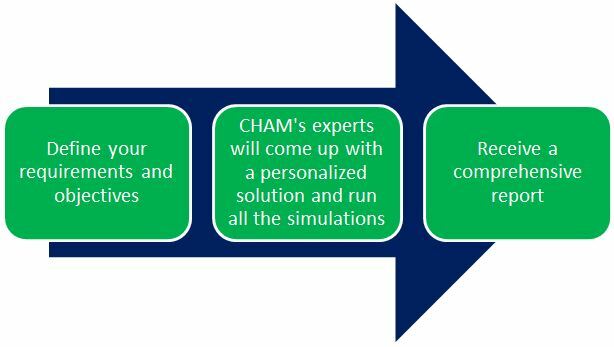 CHAM’s staff can study specific problems and provide a methodology thus enabling you to complete the project. Some of the largest, most complex, cases will take an inordinate amount of time to run on a regular desktop. For such cases, it is useful to have access to an HPC cluster that can massively reduce the time taken to perform these simulations. At CHAM we have such a cluster that can be run 24/7, giving our clients an economic way to meet the tightest of deadlines. "After using CHAM on a high profile project we had, they proved to be nothing less than exceptional in the service they delivered. They also continued to support us after the service was complete which was much appreciated. This is a company that I would recommend and use again knowing that I would get a friendly welcome"
"I really don't know what to say but thank you very much for your comprehensive support and great care of my case." "You're the best. I have all my 2D models running now!"